A shop conversion Irish boozer, but not exclusive at all. Live bands sometimes on Saturdays - sometimes with Irish connections sometimes not. Only one ale pump: Doombar - not very strong but very reasonably priced. 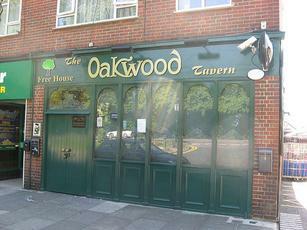 It's a bit like an Irish version of the old Cat & Lantern in East Barnet village, but larger. Apart from the poor ale selection I like it. Good staff - I always got served quickly. The place could be much better at using Twitter and Facebook to let people know what bands are playing though. They have some great bands playing here on Saturday nights. That should read "great locals"...Why npo edit button?? Great pub,and great loackls.Was in here Christmas day for an hour or so. Been coming here more regularly for a little while now, the interior including the mural of famous Irish celebrities which ranges from the sublime (reasonably accurate) to the ridiculous (just plain ridiculous) which has to be seen in full to be believed, is still present and correct. But the atmosphere is pretty good these days, service is top class, there is now one real ale (Doombar, always), prices are very reasonable and the quiz on a Thursday night is always good for a laugh and a free sandwich.